"When scrutinizing imports of vodka, beer and other beverages from Ukraine a number of breaches in consumer protection legislation were discovered," the statement said. Wednesday announcement comes as Ukraine’s Parliament is considering the second reading of a sanctions package against Russia. On Tuesday the bill, which contains 29 restrictions on Russia, passed its first reading. The proposed legislation includes a ban on all transit of Russian goods and services through its territory. In 2013 Russia imported $250 million worth of alcohol and soft drinks from Ukraine, according to data from Russia’s Federal Customs Union. Since the beginning of 2014, only $88 million worth of alcoholic and non-alcoholic beverages have been imported. In general, Russia is an exporter, and not an importer of vodka, as it can be produced cheaper than Ukraine, where production costs are high. 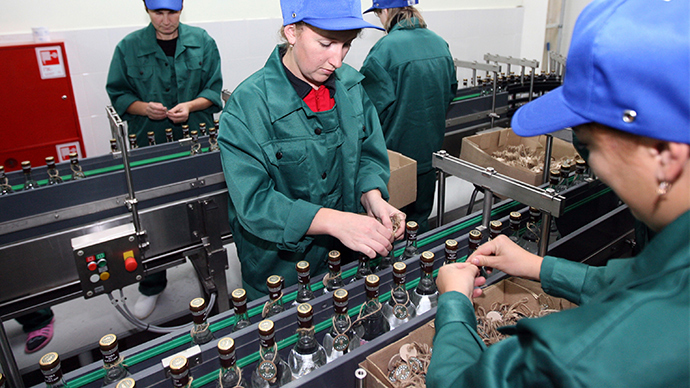 This year many Ukrainian companies bought more from Russian distilleries. Domestic production of vodka is also on the decline, and dropped 6.4 percent in the first half of the year. Vodka imports dropped nearly 16 percent between January and June. The Russian market in general has been trending towards fewer alcohol imports- in the first half of 2014, alcohol imports fell by a record 11.2 percent, according to Russia’s Federal Custom Service. Vodka imports dropped by nearly 16 percent, as whiskey dominated the import market- between January and June imports were up 33.2 percent. Russians are also importing more sparkling wines, which saw a 52.6 percent spike.